30.11.2013 | "OUT OF SIGHT" IS HERE! BRAND NEW episode just released! Rosie has an accident and ends up in hospital. She awakens to not being able to see Amy, but although she is unable to see spirits she can hear them, and she hears something lurking, watching her. 26.10.2013 | "REUNITED" IS HERE! Amy and Rosie form a plan to get Susan and Nick back together, but things go horribly wrong when Nick turns up at the house and see's Susan with another man. 17.10.2013 | BRAND NEW EPISODE IS HERE! BRAND NEW episode just realeased! Nick tells Susan about Justin, how he died, and how he can also see Amy. In this episode we also learn how Susan is able to see ghosts. Limited stock so make sure to secure your DVD if you're a fan of the show, or you already own the other DVD's because once they're gone, they're gone. Remember guys - I'm not a production company that produces DVD's. I make them all myself, to the highest quality possible for home made DVD's. If you're unsure of the quality, then just read the feedback from other buyers. 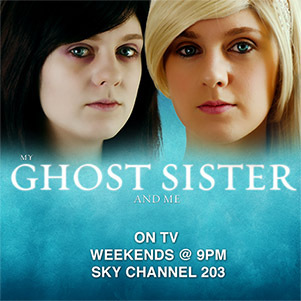 6.8.2013 | MY GHOST SISTER AND ME ON TV TOMORROW! 4.8.2013 | SEASON 3 CONTINUES OCTOBER 17TH! Yep, you read it right! My Ghost Sister and Me continues October 17th and when the show is back there will be weekly episodes and new episodes will come out on a thursday. Watch the video for more information! Webvee Guide has reviewed us! "The supernatural aspect may be the hood ornament, but underneath the hood (or bonnet) is an earthly story about love and loss and the importance of family. You have to like that." 18.5.2013 | MID-SEASON FINALE IS HERE! BRAND NEW My Ghost Sister and Me episode is here! "Truth" is the mid-season finale with a BIG reveal! NEW Teaser Trailer for the new My Ghost Sister and Me episode titled "Truth"
27.4.2013 | SEASON 3 EPISODE 5 "SPIRIT AWAY"
BRAND NEW My Ghost Sister and Me episode is here! Rosie spends the weekend at her dads house, but something isn't quite right when she's awoken by paranormal activity, but who's the ghost causing it? All of the new episodes from now on will only be uploaded there. 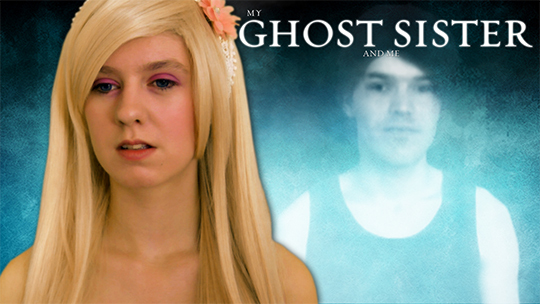 The official My Ghost Sister and Me YouTube Channel is now for bonus content only. This is to make it easier for viewers to find new episodes, as before the same episode were uploaded on 3 different channels - talk about confusing! 6.4.2013 | SEASON 3 EPISODE 4 "THE SLEEPOVER"
Amy and Rosie have their first fight when Rosie invites her friend for a sleepover, but Amy causes some Ghostly trouble in "The Sleepover"
Here's a Trailer for the next My Ghost Sister and Me episode "The Sleepover"
2.3.2013 | "A VISIT FROM THE PAST" IS HERE! 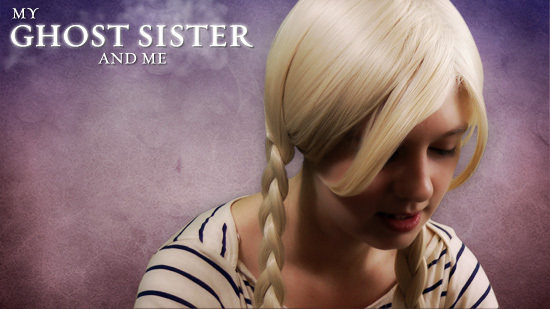 Here is a preview/trailer of the new My Ghost Sister & me episode titled "A Visit From The past"
People are asking to see more My Ghost Sister & me episodes, but they won't be out until March/April as I'm still filming & editing them, and there's a lot to do. There will be 13, maybe 14 episodes this season, were as last season we had 8, so there's much more to do. Hang in there - it will be worth the wait I promise you! 8.12.2012 | SEASON 3 EPISODE 2 "WHAT WAS THEN" IS HERE! Season 3 Episode 2 "What Was Then" is here!. Enjoy! This will be the last episode until after the Christmas period, and then the rest of season 3 will begin broadcasting sometime in March. I know it's been a slow start this season with getting the episodes out, but that's only because there's a lot to do, and not enough time to do it. We're almost finished filming the entire season, and the editing is under way, but there's a lot of work to be done, so hang in there! 26.11.2012 | SEASON 2 OUT NOW ON DVD! Here is a preview of the cemetery scene from the next season 3 episode "What Was Then"
29.9.2012 | "WHAT WAS THEN" Teaser Trailer! 24.8.2012 | SEASON 3 IS HERE! After a HUGE wait Season 3 is FINALLY here. We kick off the season with "Surprise". The episode was written by our very own Heather, and co-written by Jason. It's Heathers very first time writing an episode, and it turned out great! 24.8.2012 | SEASON 3 BEGINS NEXT SATURDAY! 21.8.2012 | SEASON 3 DELAYED. Rosie suffers an accident that stops her seeing Amy, and with her ability not quite working she hears something lurking, watching her. Will she find out what it is, and get her ability back? Find out in the Season 3 Episode "Out Of Sight"
- Amy and Rosie try and get their mum and dad back together, but things don't quite go according to plan when Nick turns up and sees Susan with another man. Here is the official trailer for the first episode of season 3. Enjoy! I decided to put this one up ahead of the episodes because my YouTube Channel hadn't had any uploads for a few weeks due to me being ill, and I'm also sharing it here cause you guys will enjoy it. The role is only a small one and you have 8 lines approx.